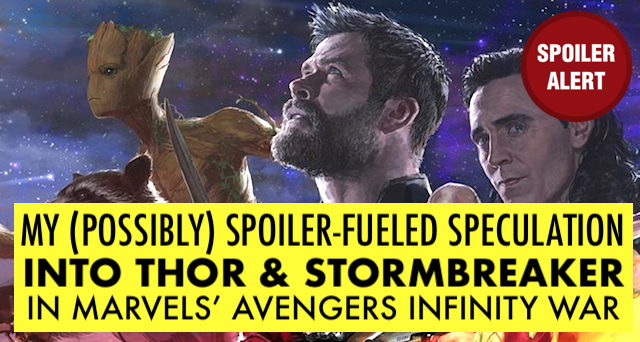 *BE WARNED*: This blogpost, while mostly speculative, might well "accidentally" include/feature *SPOILERS* for the upcoming Marvel's Avengers Infinity War film, and as well gives away plot/story for Thor: Ragnarok (in case you've not seen it). 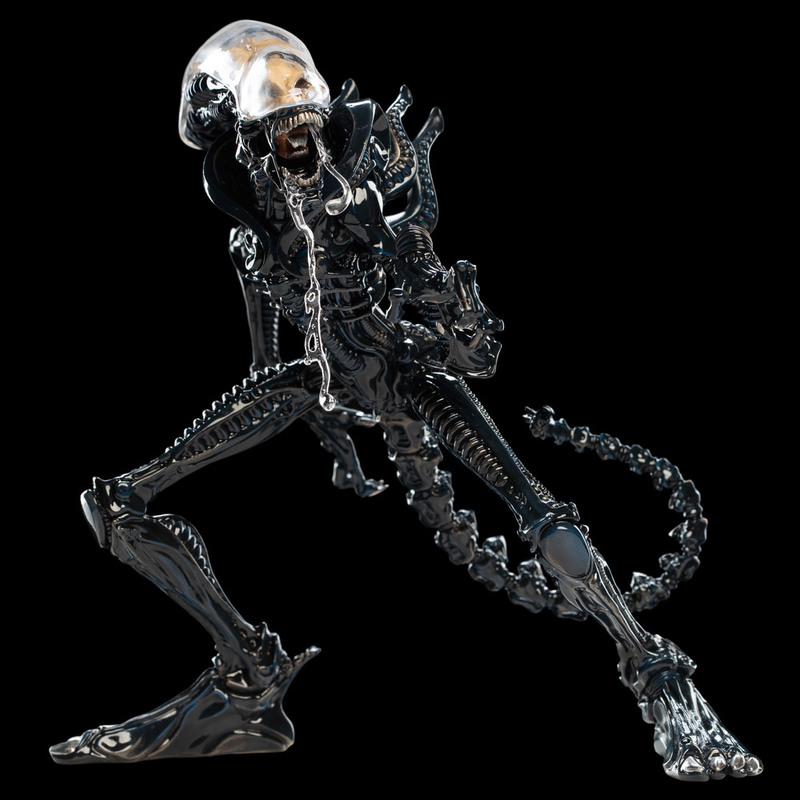 This article is largely based on my assumptions, culled from rumours found online, while based on images seen in both TOY (*primarily Hot Toys and LEGO) and VIDEO PROMOS thus far. 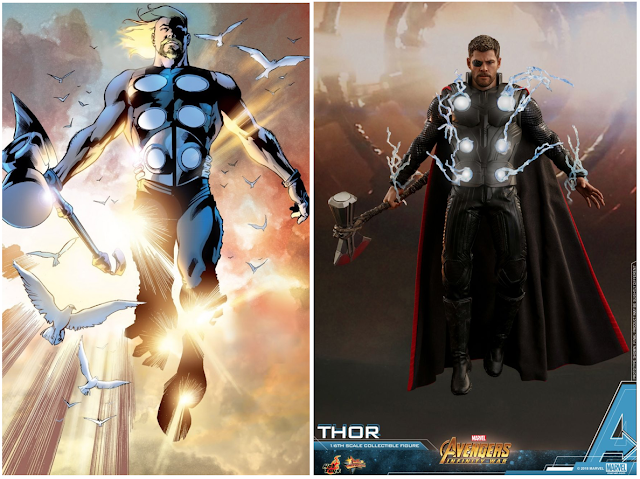 Thus far from the promos we don't see "Valkyrie" or Thor's liberated gladiator compatriots from Sakaar, so maybe they flew away separately, before Thor and company met Thanos? Or Thanos and The Black Order beat them down too? Or maybe Thanos has not appeared yet, and it is all the brutality of The Black Order (Thanos' children ... brothers & sisters to Gamora and Nebula? :p), we are introduced to first? What transpired next has not been fully revealed. 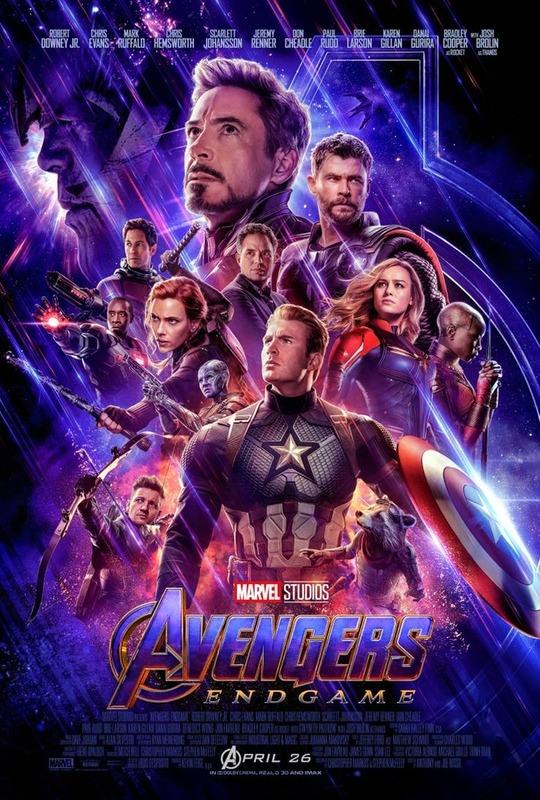 We see from the first trailer, (presumably) dead folks lying on the battlefield, with the next scene showing Loki offering up the Tesseract to an unknown person, which might be Thanos or The Black Order, who possibly tracked down the Cube/Gem, and crossed path with the ship, and decimated it to retrieve the Cube. Perhaps Loki used the Cube to bargain for his life? Does that also mean the Asgardians are now “extinct”? (Save for Loki and Odinson, of course :p). Without a doubt, a battle ensued when Thanos reached Thor's ship, which left Thor beaten and left floating abandoned in space (*From the much earlier "leaked" SDCC screener footage, Thor was literally seen floating in space), whom the Guardians of the Galaxy (on their spaceship "Milano") came across, and rescued Odinson, who had then awoken to the crew (seen in trailer screen grabs). 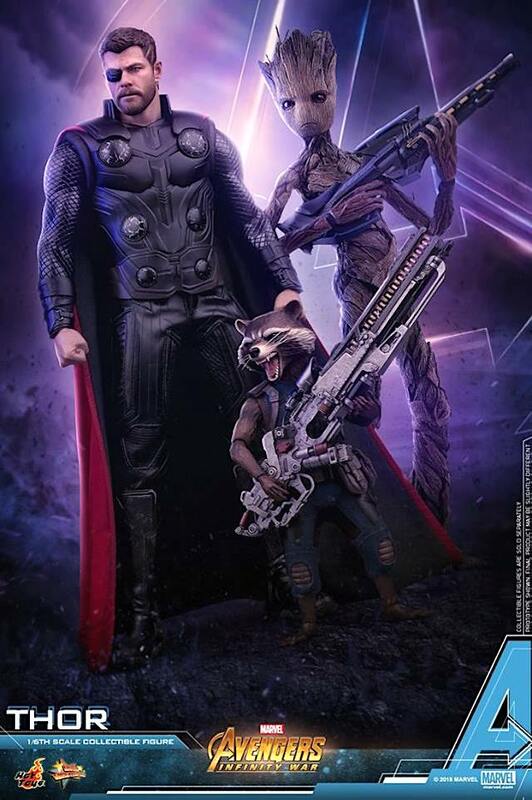 What transpires next, what Thor says/mentions - manages to convince the Guardians to dispatch Rocket Raccoon and (Teenage) Groot to go alongside Thor to Nidavellir in search of a new weapon to be crafted by the Dwarves - would to me be a "make-or-break" of the logic in the story, IMHO. How do you convince this ground of semi-cynical folks that what you say is true? 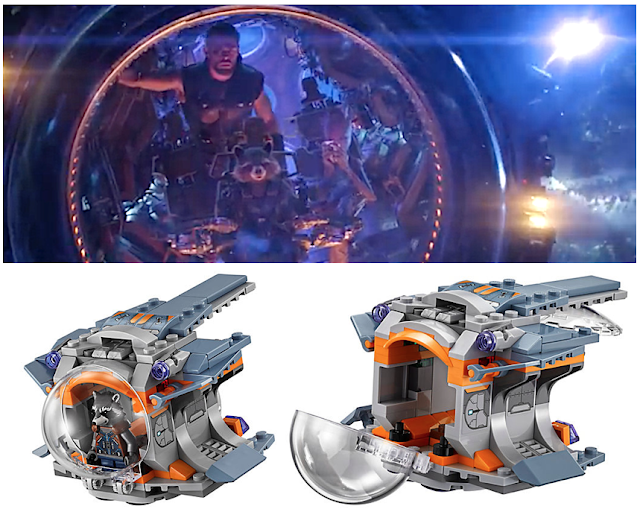 From the product/item description of the "Thor's Weapon Quest" LEGO playset, the "Escape Pod" in which they travel in, "can be connected to The Guardians’ Ship in 76107 Thanos: Ultimate Battle." 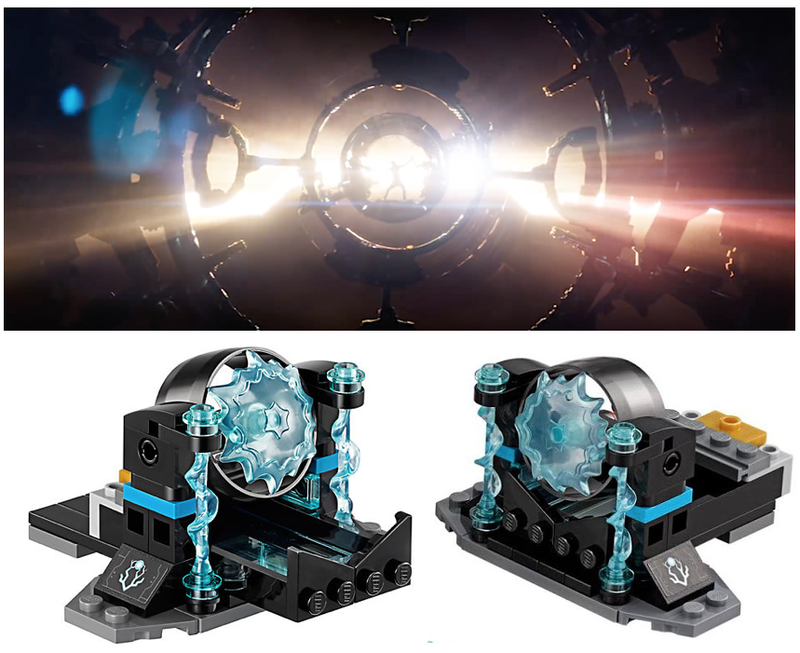 As well the "space station" includes a "cosmic power source, weapon and features, the Infinity Stone element and stand." ... Now reading this, then perhaps Loki did not give the Tesseract to Thanos, but to Thor himself? "Cosmic Power Source" vs "Cosmic Cube" (AKA The Tesseract)? 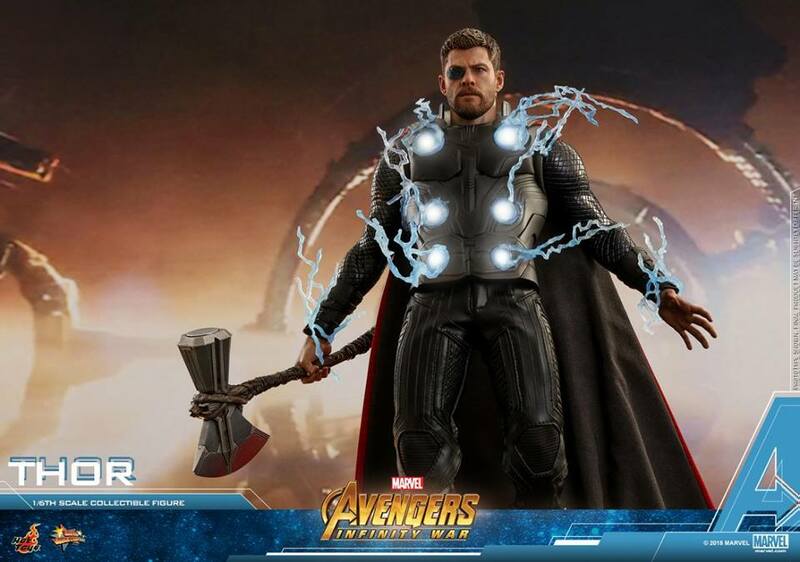 Regardless, Thor pumps some of his lightning-juice onto the weapon-making-machine and ut pops “STORMBREAKER”! 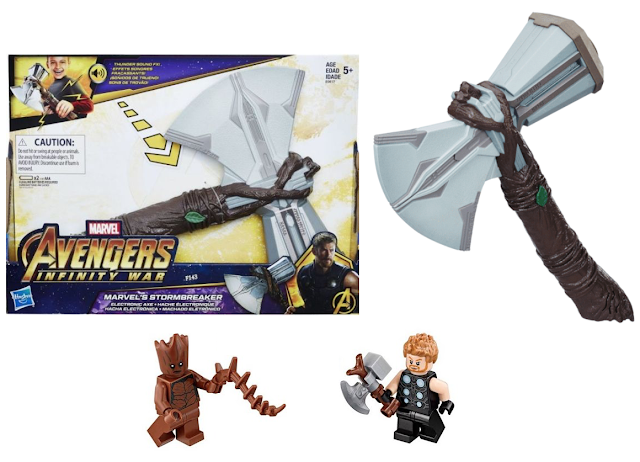 A Hasbro toy of "Stormbreaker" (name first revealed thanks to said toy) has suggested that the handle of the weapon is "made of pure Groot", and we see Groot's vine outstretched no doubt in concert with the film's action (you don't put in a feature like that without a story, no? :p), so that'll be a very interesting connection and link between Odinson and Groot, rather than just "travelling buddies", methinks! If you “recognise” the Stormbreaker, it’s because this incarnation has made an appearance in The Ultimates comicbook universe’s "Avengers", wielded by that universe's Thor. As well the name "Stormbreaker" itself is linked to the comicbooks, as it is the name of Beta Ray Bill's primary weapon, parallel to Thor's Mjolnir. 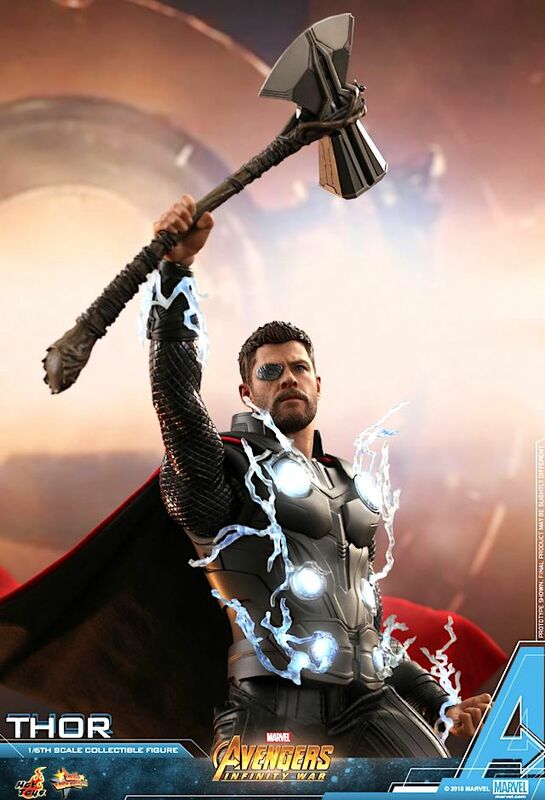 I suspect this "Stormbreaker" is an amalgam of both origins, IMHO. 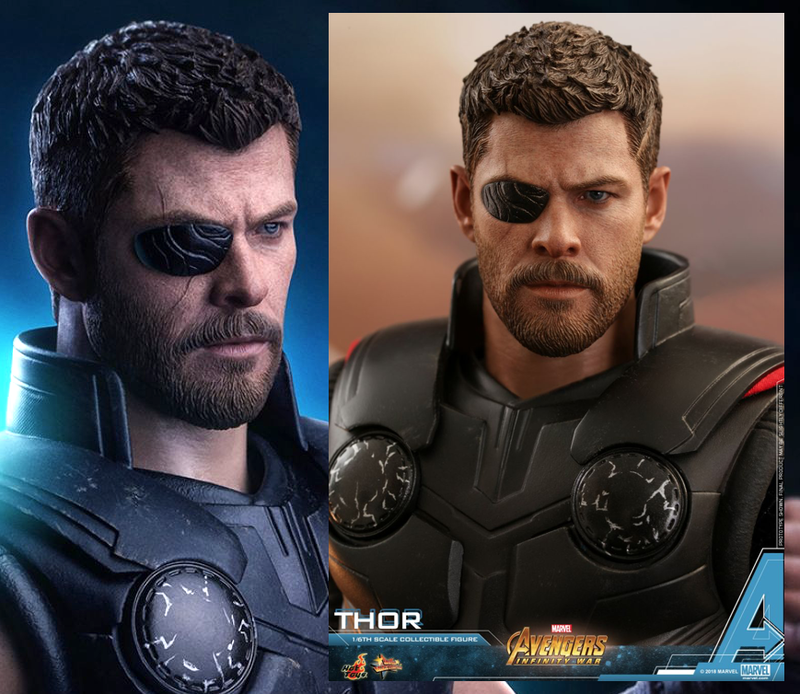 Since the appearance of actor Samuel Jackson as the eye-patched "Nick Fury" in the end scene of "Iron Man" (2008), it has been pretty evident the Marvel Cinematic Universe has been gleefully drawing story and origin elements from the Ultimates Universe, including the costumes and visual designs (Hawkeye, Black Widow etc), it serves as no huge surprise the (visual) origins of "Stormbreaker", IMHO. Even his costume (in Infinity Wars) matches the Ultimate's version. 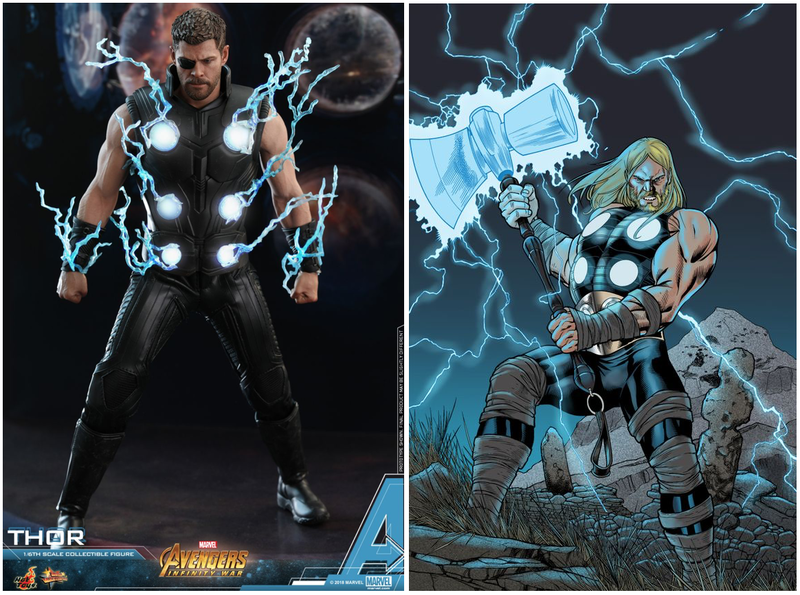 (Above-right+Below: Hot Toys THOR in 1/6th / Right: Artwork by Carlos Pacheco (pencils) + Dexter Vines (inks). 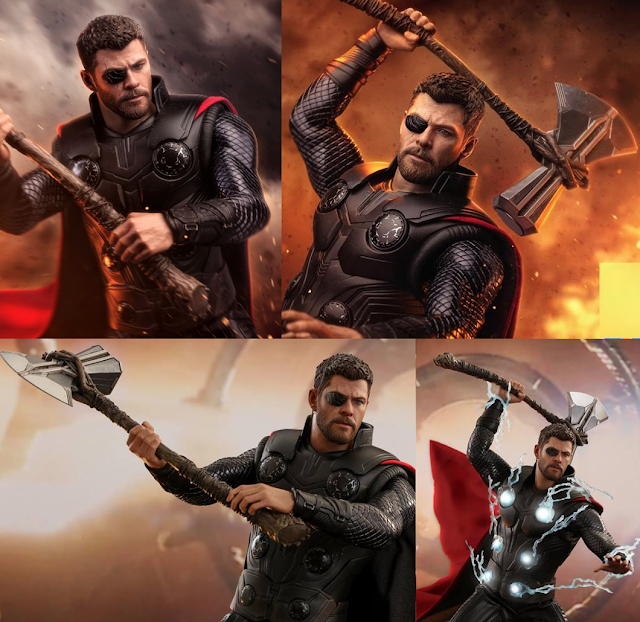 BUT all this hypothesis might well be negated by other "toy reveals", in this case from Hasbro (Images via ToyArk) where in their Legends Boxset, Thor wields a broadsword (borrowed from Stepphenwolf? 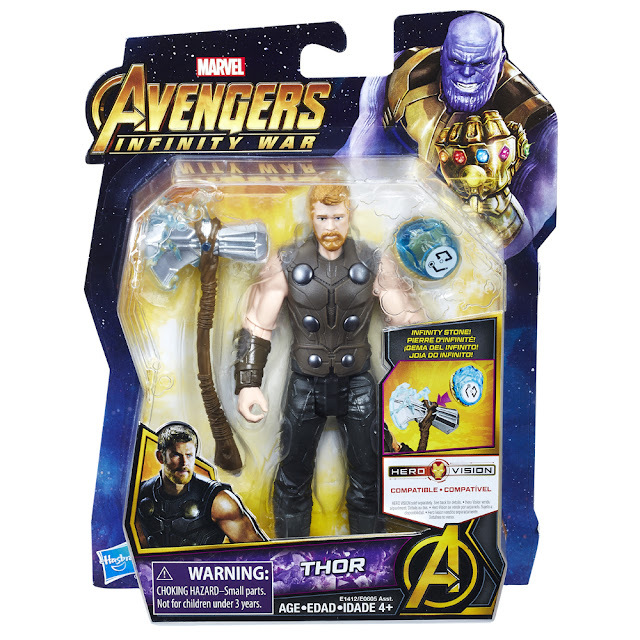 LOL), AND in their TITANS-line ... whereas THIS particular figure is titled "Marvel Avengers: Infinity War Thor with Infinity Stone" = So perhaps Loki DID give Thor the Tesseract? 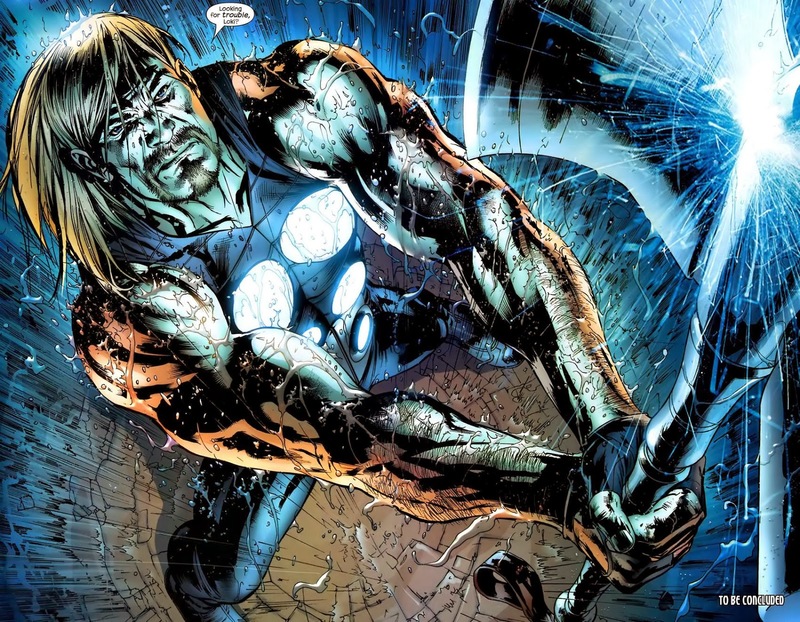 And it rests on Stormbreaker as it did Loki's sceptre in the first "Avengers" film did? And while any mention of Thor facing up against Thanos and the Black Order has yet been revealed in any video promos (thus far), and how his weapon works against Thanos, more likely will be seen in the sequel to Infinity War, in the as-yet-titled “Avengers 4”, perhaps? Why such a focus on the "weapon", instead of the "superhero"? I figured in the process of destroying a monster/monsters, either they are dispatched into the Phantom Zone (Oops! 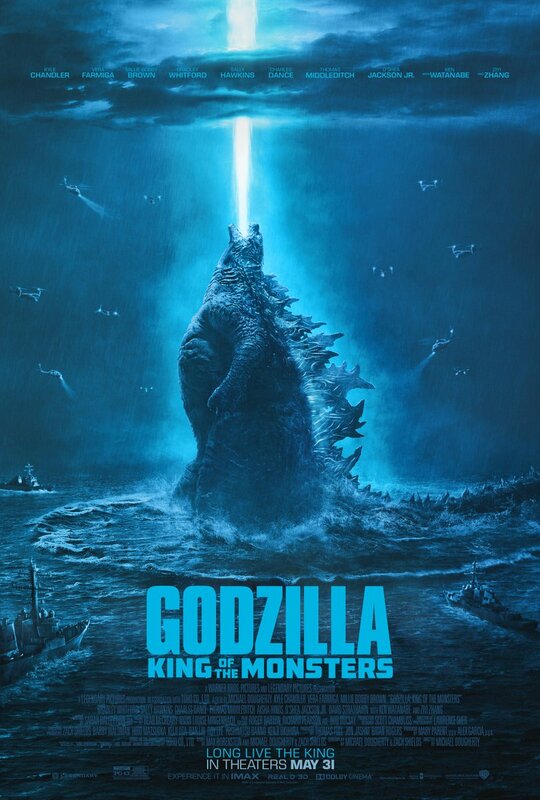 Wrong brand), or someone needs to kill some people, so that means some superhero(s) sacrifices his principles to "KILL" (*BUT since they are "aliens", and we've previously seen them kill hella aliens in the first movie, that no longer is a issue, no? Smart move, Marvel!) - but in order to do that, they'd need a hella weapon to do the deed. 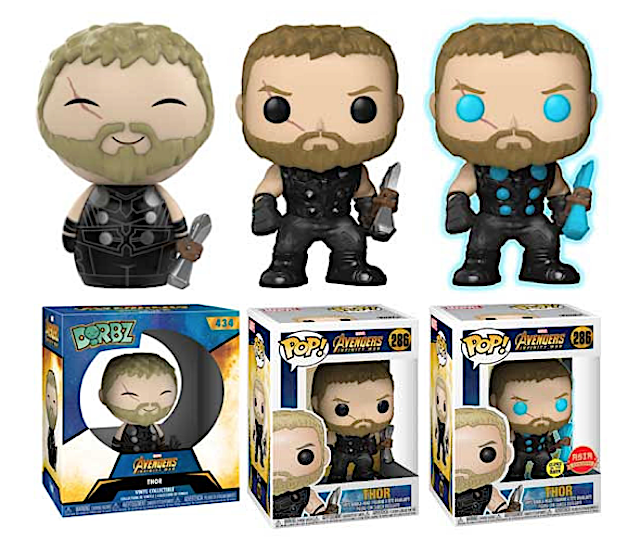 So will Thor lose the Infinity Gem to Thanos' Infinity Gauntlet? 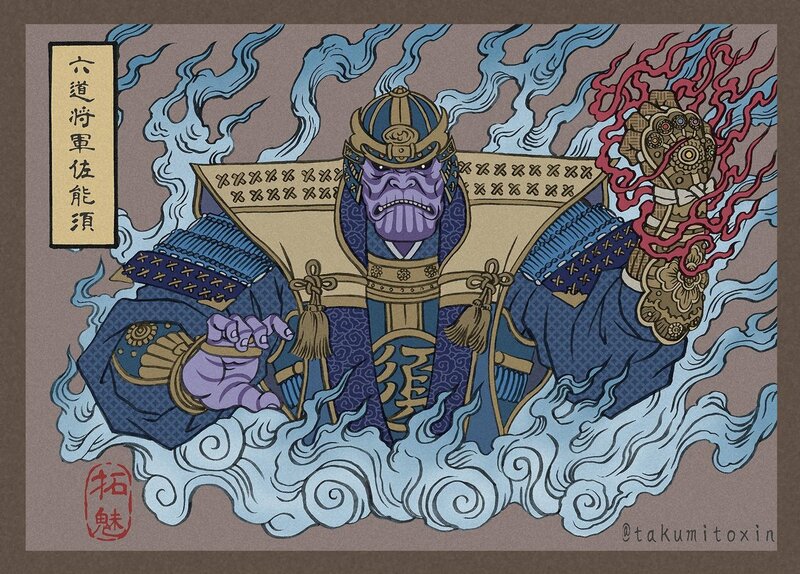 Or will that stone help annihilate Thanos and company? Or banish them from Planet Earth? Hoped you folks enjoyed my geekout (heh) ... What do you think? What works for you? What do you think I am missing out on? Shares with us in the comments section of this blogpost, thanks! *FAIR WARNING*: Everything can well be a *SPOILER* in this post, from my article to your comments, okay?